California’s wastewater sector, which plays a crucial role in protecting publichealth and the environment, is at a turning point. Water supply and demand conditions are being affected by population growth, technology and policy changes, and drought. Climate change will bring new challenges. Wastewater agencies are tasked with reliably removing pollutants from water discarded to sewers, even as the quantity and quality of the water they treat declines. Of the multiple climate pressures that are likely to affect wastewater management, drought poses the biggest challenge for the sector. The unusually hot drought of 2012–16 provided a vivid demonstration of conditions that may become more common as the climate warms, and was a wake-up call for wastewater agencies. 1) Maintaining water quality in the face of changing water use.Wastewater management is challenged by short-term water conservation during droughts and longer-term reductions in water use from indoor efficiency measures—conditions which are largelybeyond the sector’s control. Reductions in indoor water use can damage infrastructure and reduce the effectiveness of existing treatment processes. Such challenges may grow as severe droughts become more frequent with climate change and as water efficiency increases. Better coordination and information sharing with water suppliers, and sector-wide planning for future droughts, are key to addressing these changes. 2) Making smart recycled water investments. Wastewater agencies produce highly treated water that is increasingly being reused as a water supply. Coordination among wastewater and water supply agencies is essential to respond to the increasing demand for recycled water. Formalized planning for recycled water projects at the regional level will likely lead to more efficient processes and better outcomes. New investments must be responsive to changing water use, climate change, and pending regulations. 3) Balancing conflicting objectives within watersheds. Most wastewater treatment plants discharge treated water into inland watersheds. Adapting to declining water use and meeting increased demand for recycled water may conflict with environmental objectives and the demands of downstream users. Rivers and streams are expected to experience lower flows and higher temperatures, which will heighten threats to aquatic ecosystems. Resources to identify areas most at risk of conflict over the use of treated wastewater are needed, as are tools to evaluate the impacts of water recycling projects on the environment and downstream water users. 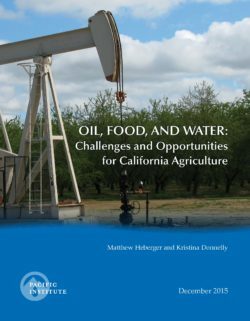 The state should also analyze its policies to identify tradeoffs and resolve conflicts between its water supply, water quality, and environmental goals. Advancements in engineering and technology can help wastewater agencies adapt to a changing climate―but shifts in policy and planning will facilitate a more efficient and effective path toward building resilience. The latest drought provided a window into the looming challenges facing the wastewater sector. 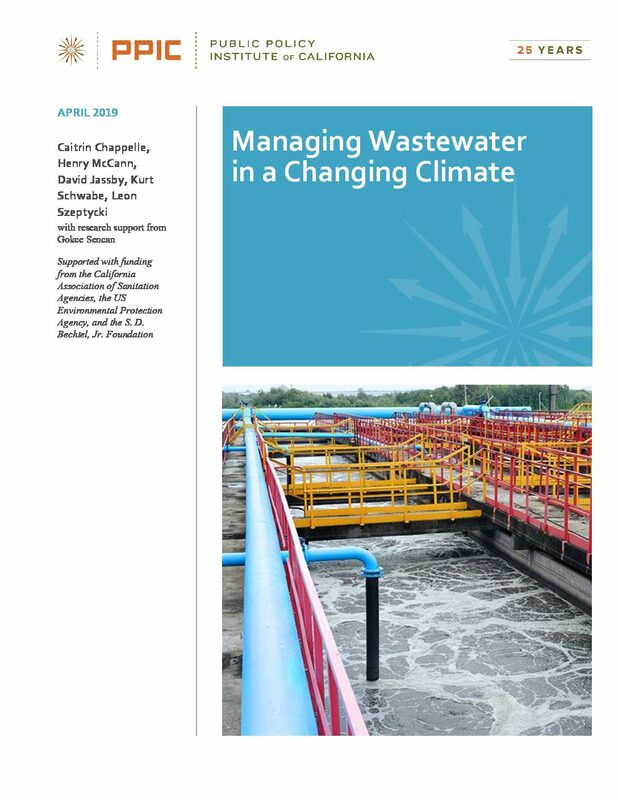 Forging new partnerships and evaluating the full range of climate-related risks will help the sector determine the best adaptations and policy improvements needed to prepare the wastewater sector for a more volatile future. 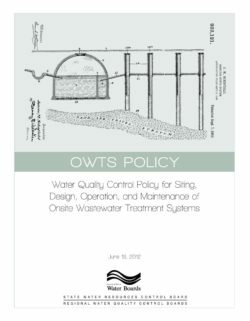 The purpose of this Policy is to allow the continued use of OWTS, while protecting water quality and public health. This Policy recognizes that responsible local agencies can provide the most effective means to manage OWTS on a routine basis. Therefore as an important element, it is the intent of this policy to efficiently utilize and improve upon where necessary existing local programs through coordination between the State and local agencies. To accomplish this purpose, this Policy establishes a statewide, risk-based, tiered approach for the regulation and management of OWTS installations and replacements and sets the level of performance and protection expected from OWTS. In particular, the Policy requires actions for water bodies specifically identified as part this Policy where OWTS contribute to water quality degradation that adversely affect beneficial uses. This Policy only authorizes subsurface disposal of domestic strength, and in limited instances high strength, wastewater and establishes minimum requirements for the permitting, monitoring, and operation of OWTS for protecting beneficial uses of waters of the State and preventing or correcting conditions of pollution and nuisance. And finally, this Policy also conditionally waives the requirement for owners of OWTS to apply for and receive Waste Discharge Requirements in order to operate their systems when they meet the conditions set forth in the Policy. Nothing in this Policy supersedes or requires modification of Total Maximum Daily Loads or Basin Plan prohibitions of discharges from OWTS. This Policy also applies to OWTS on federal, state, and Tribal lands to the extent authorized by law or agreement. The collection and treatment of wastewater remains among the most important public health interventions in human history and has contributed to a significant decrease in waterborne diseases during the past century. Nevertheless, waste discharges from municipal sewage treatment plants into rivers and streams, lakes, and estuaries and coastal waters remain a significant source of water quality problems throughout the country. The Clean Water Act (CWA) establishes performance levels to be attained by municipal sewage treatment plants in order to prevent the discharge of harmful wastes into surface waters. The act also provides financial assistance so that communities can construct treatment facilities and related equipment to comply with the law. Although approximately $95 billion in CWA assistance has been provided since 1972, funding needs for wastewater infrastructure remain high. According to the most recent estimate by the Environmental Protection Agency and the states, the nation’s wastewater treatment facilities will need $271 billion over the next 20 years to meet the CWA’s water quality objectives. Meeting the nation’s wastewater infrastructure needs efficiently and effectively is likely to remain an issue of considerable interest to policymakers. The CWA authorizes the principal federal program to support wastewater treatment plant construction and related eligible activities. Congress established the CWA Title II construction grants program in 1972, significantly enhancing what had previously been a modest grant program. Federal funds were provided through annual appropriations under a state-by-state allocation formula contained in the act. 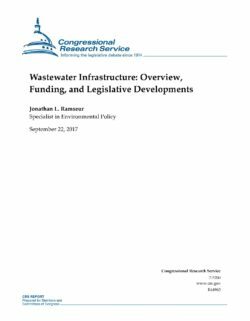 States used their allotments to make grants to cities to build or upgrade categories of wastewater treatment projects including treatment plants, related interceptor sewers, correction of infiltration/inflow of sewer lines, and sewer rehabilitation. In 1987, Congress amended the CWA and created the State Water Pollution Control Revolving Fund (SRF) program. This program represented a major shift in how the nation finances wastewater treatment needs. In contrast to the Title II construction grants program, which provided grants directly to localities, SRFs are loan programs. States use their SRFs to provide several types of loan assistance to communities, including project construction loans made at or below market interest rates, refinancing of local debt obligations, providing loan guarantees, and purchasing insurance. In 2014, Congress revised the SRF program by providing additional loan subsidies (including forgiveness of principal and negative interest loans) in certain instances. The law identifies a number of types of projects as eligible for SRF assistance, including wastewater treatment plant construction, stormwater treatment and management, energy-efficiency improvements at treatment works, reuse and recycling of wastewater or stormwater, and security improvements at treatment works. In both FY2016 and FY2017, Congress provided $1.394 billion for the clean water SRF program. President Trump’s FY2018 budget proposal requests the same amount as provided for the previous two fiscal years. Although appropriation levels have remained consistent in recent years (in nominal dollars), policymakers have continued to propose changes to the funding program. Issues debated in connection with these proposals include extending SRF assistance to help states and cities meet the estimated funding needs, modifying the program to assist small and economically disadvantaged communities, and enhancing the SRF program to address a number of water quality priorities beyond traditional treatment plant construction—particularly the management of wet weather pollutant runoff from numerous sources, which is the leading cause of stream and lake impairment nationally.